India has been a latecomer to Africa. But with an eye on China, it has been boosting trade and bilateral ties. India has two reasons to take an interest in Africa – it’s deeply concerned about China’s forays into the continent’s strategic and economic space, and it’s also mindful that it requires the support of its 54 nations if it is to realize its ambitions to become a permanent member of the U.N. Security Council. India is a latecomer in Africa, but as a demonstration of its pro-active engagement with the continent, the government this week announced that its trade target with the continent has now been revised upwards to $90 billion by 2015, up from the previous target of $70 billion. 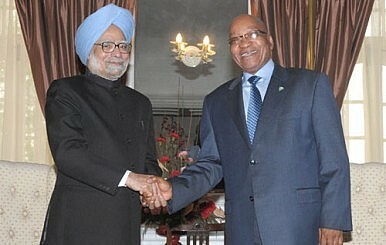 The announcement came on March 17, when the India-Africa Business Council met in New Delhi for the first time. The second meeting of India-Africa trade ministers took place the same day. The growing ties between India and African nations has seen bilateral trade soar over the past decade, and India has established a number of pan-African institutions under the umbrella of the India-Africa Forum Summit for capacity building and human resource development across many areas, including the India-Africa Institute of Foreign Trade, the India-Africa Diamond Institute, the India-Africa Institute of Educational Planning and Administration and the India-Africa Civil Aviation Academy. Yet another institution, the India-Africa Business Council, was launched on March 17, with a brief to put in place a vibrant mechanism for enhancing economic and commercial relations between the two sides, especially in areas including agriculture, agro-processing, manufacturing, pharmaceuticals, railways, energy and petroleum and natural gas. As of now, India is in no position to take on China in Africa. But the Indians are clearly making a concerted pitch to win friends and influence people there. Is Africa the Next Asia?China’s Development DiplomacyWhy China Succeeds in AfricaChina’s Achilles’ HeelIs China’s Africa Safari Faltering?